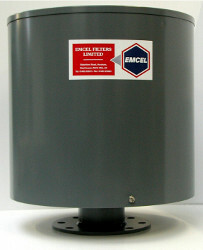 A range of composite activated carbon Tank Breather filters has been developed by EMCEL Filters to control the pollution effects of discharges and are particularly relevant in cases where the displaced air arising from tank filling or temperature effects contains odorous, hazardous or toxic vapour contaminants. Outer casings are manufactured in a wide variety of materials and finishes including weather resistant painted steel, stainless steel, polypropylene and uPVC. A number of filter unit arrangements, flanges and fixings are available to match the wide variety of tank breather and vent outlet configurations that exist. Both vertical and horizontal airflow discharges can be accommodated and, in addition to the standard particle pre-filtration, the EMCEL tank breather filter can be supplied with spark arresters, HEPA filtration and weather cowls if required. EMCEL Tank Breather filters are manufactured in a standard range of designs and sizes or may be custom built to suit specific filtration requirements.